What sounds, sights, smells, activities, and tastes instantaneously transport you to a summertime state of mind? This week’s Frothy Five, presented by Beer in Boulder, is a collection of a few of these quintessentially summer sensations. From explosions of refreshing fruity flavors to barbecues to live backyard music and more, Boulder County’s craft breweries are giving us all the summer vibes this week. Here are our picks for five of the most fun and sunshine-filled events happening this week at craft breweries around the county. Every week we can’t help but feel like Left Hand Brewing Company is reading our minds with their creative, expertly chosen, seasonally spot-on Infusion Friday concoctions. This week they’ll take the already extremely refreshing Good Juju, a malty light ale packed with fresh ginger, and make it a tropical summer treat with the additions of hibiscus tea and peaches. Hone in on the Left Hand taproom as your happy hour destination today and sample this summertime in a bottle brew. The tapping of Bob’s Cedar IPA at Crystal Springs Brewing Company in Louisville this Saturday is a special one. Having opened in 2010, Crystal Springs is a brewery that came about as the result of a father and son’s continued love of brewing beer at home together starting as far back as the 1980s. Factors like school, relocation, and quite simply time resulted in this father and son duo not brewing a batch of beer together in a long time, until this year’s Bob’s Cedar IPA. Be sure not to miss out on the chance to try this award-winning beer as well as the various other small batch brews that Crystal Springs offers. Nothing quite says summertime like a barbecue. This Saturday stop by Upslope Brewing Company’s Lee Hill taproom for a BBQ craft brewery-style with food from Rollin’ Bones BBQ, tons of great Upslope beer, live music from Defunkt Railroad, games, and more. Be sure to leave room for dessert after your meal, as a barbecue isn’t a barbecue done right without a pie-eating contest! Celebrate summer in all its juicy, honey-smoked glory with the family and with friends at this great cookout. 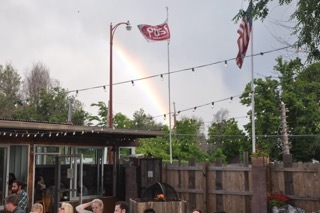 Housed in a historic building in Lafayette and self-described as a chicken and beer joint, The Post Brewing Company and its outdoor patio is a wonderful place to relax, put your feet up, and enjoy that cathartic sensation of a belly full of great food and great beer and an earful of jamming live music. With beers from brewmaster Bryan Selders and food from The GoodBird Kitchen and Chef Brett Smith, The Post is a great spot for a family-style meal, cozy backyard entertainment, and relaxation. Every Sunday afternoon The Post hosts Music in the Yard events. This Sunday features Barrel of Blues and promises to be a quintessential Colorado summer afternoon. Boulder County’s breweries often act as the glue that brings multiple factions of our county’s communities together. Through local live music acts and widely varying events that cater to foodies, beer-lovers, athletes, intellectuals, and everyone in between, breweries and their craft beer are a common denominator that bring much of our population to common ground. Trivia competitions are perhaps the most popular of these community-building events and are a tradition practiced by a huge number of breweries in the area. With Tuesdays being the biggest trivia night of the week, there is trivia galore at the likes of Front Range Brewing Company, Wibby Brewing Company, Asher Brewing Company, Odd13 Brewing Company, and many more. Bootstrap Brewing Company in Niwot is holding a trivia night this coming Tuesday in the spirit of fun and friendly competition and community engagement. Stop by, kick start your brain waves with a Flagstaff Amber or Worthog Stout and enjoy this exciting Niwot brewery and their award-winning, flavorful beers. Be sure to sign up for the Beer in Boulder Weekly List of Events email to receive a comprehensive list of all Boulder County craft brewery events happening in the coming week. Until our next flight, cheers!